Mitchell's Tavern, Chinatown Inn, and the Apollo Cafe were visited. 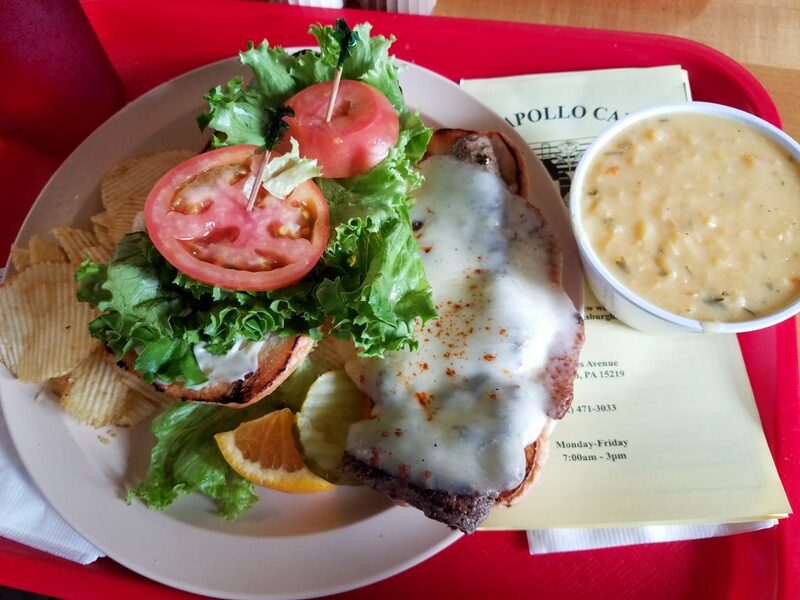 Charcoal grilled steak and cheese sandwich and lemon chicken and rice soup at the Apollo Cafe. Before the holidays I was looking through my mail and there it was. The dreaded jury duty summons. The Allegheny County Court of Common Pleas was requesting the pleasure of my company on an upcoming Monday at 8 a.m. I reported at the day and time that the summons had stated. No one seemed especially happy to be there. I wasn’t either, but had thought that if I was a defendant or plaintiff in a trial I would want a good, civic-minded person like myself to decide the case. Plus there was a good chance that the case would be settled before trial or that I wouldn’t be picked. The county workers who manage the juror selection process were all very nice and try to put people at ease. The first order of business was filling out a general questionnaire. After those were turned in, potential jurors could go into an adjacent waiting room and watch TV. There was also free coffee (in the morning), and snack and beverage vending machines. I had brought a lot of reading material which was good because we sat around for several hours until lunchtime. We were given a one hour lunch break. I went to Bruegger’s Bagels where I had a serviceable, basic sandwich for lunch. I then returned to the City-County Building’s juror waiting room and watched more TV and read. Everybody sat around for a few more hours until 4 p.m. when we were summoned back into the main room to continue the juror selection process. Names were called to reduce the size of the pool by approximately half. If your name was called you stayed, if not you left. Mine was called. Then one by one potential jurors were called up to a table for a brief interview with the plaintiff and defense attorneys. A little bit after that the jury was announced. Again my name was called and I moved to the other side of the room to sit with my new fellow jurors. We were told that it was a personal injury case and would last for 3 to 4 days. I accepted my fate and we were dismissed for the day. When we first reported for jury duty we were told that certain restaurants and other businesses offered discounts to jurors and we could pick up a printout listing the participating establishments. The printouts also listed discounts for massages, haircuts, and a few clothing/accessory boutiques. All you had to do was give the business the coupon part of your daily juror sheet. I decided that if jury duty was like being given lemons, then I would make lemonade. I would dine out at local restaurants and chronicle my experiences. 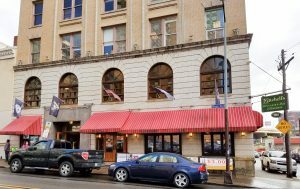 My first culinary adventure was Mitchell’s Tavern (304 Ross St.), a longtime (since 1906) downtown eating and drinking establishment. I had never been there before. A fellow juror and I headed there and were seated by a young and somewhat robotic hostess. Our fortunes soon turned around when our waitress came to the table. Her name was Tammy and she was friendly and helpful in answering our first-timer questions about some menu items. I ordered one of the original Mitchell’s classics listed on the menu—Caulfield’s Hot Meatloaf sandwich ($8.50). 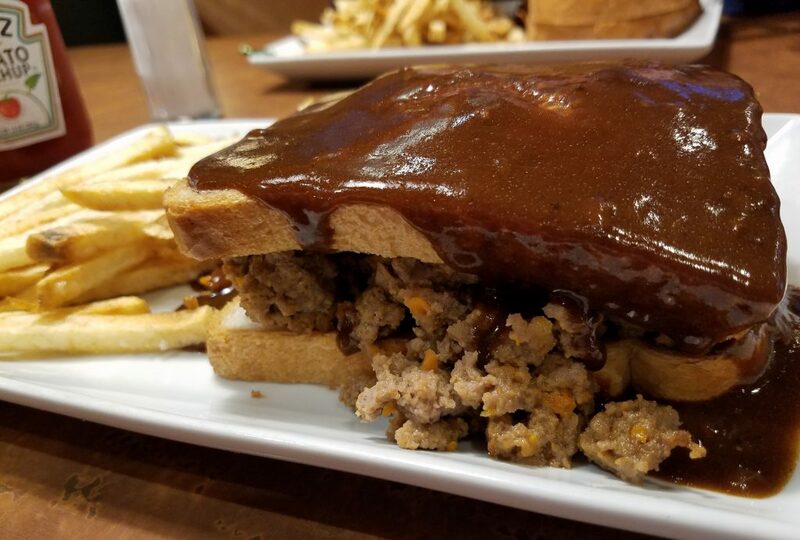 The sandwich is made from a 100-year-old recipe and consists of two pieces of pullman white bread with meatloaf inside and pan-dripping gravy served over the sandwich a la a hot roast beef sandwich. The gravy was very dark; when Tammy brought it to the table it looked like I was being served a whole, rectangular Boston cream pie. It normally comes with homemade mashed potatoes and a house vegetable. I substituted fries and cole slaw. The sandwich was savory and delicious, but unusual in the sense that the meatloaf instead of being all slices, had a fair amount of loose meat. We were dining near the end of lunch hour and maybe that was the last of the batch. Caulfield’s Hot Meatloaf sandwich at Mitchell’s Tavern. 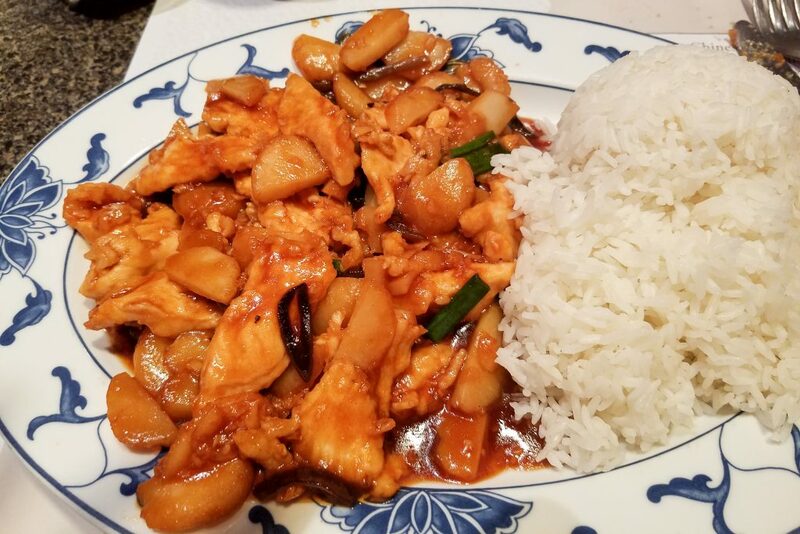 The next day I ventured out on my own and checked out a few places before settling on one of my longtime favorites—Chinatown Inn (520 Third Ave.). 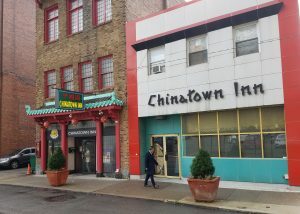 When I was a young child and my parents would take my brothers and sister and me to visit Santa or see the store windows at Kaufmann’s, we would stop at Chinatown Inn. It was the first Chinese restaurant I had ever dined in. The food and service were always good. Chinatown Inn is a beautiful restaurant with comfortable seating. The restaurant offers a lunchtime special of soup and egg roll or plain egg foo young, rice, and an entrée. I had never seen garlic chicken offered on Chinese restaurant menus. Intrigued, I ordered that and wonton soup, shrimp egg roll, and rice. The soup was good and the egg roll was crispy-fried nicely with a few small shrimp and vegetables inside. The garlic chicken was awesome. It had a different kind of Chinese restaurant sauce, heavy on garlic, with a little sweetness and tang. Winnie was my server and provided excellent service. No juror discount is offered at Chinatown Inn, but at only $8.88 for my lunch special it wasn’t really missed. (For more about Chinatown Inn see our 2015 review). 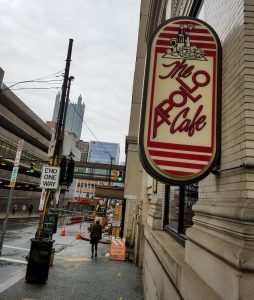 On my fourth day of jury duty after watching the third video deposition from a third doctor on rotator cuff injuries I went with juror #6 to a place where he had dined the day before—the Apollo Cafe (429 Forbes Ave.) This was a new discovery for me and I’m glad I joined him. It was a funky little joint with dining areas on the ground level and a “crow’s nest” above. There was a serving line where you place your order and pick up a tray as you move past their soups, salads, Mediterranean delicacies, and dessert selections. They give you a number so the food runner can find your table when your main item is ready. I ordered the charcoal grilled steak and cheese ($7.25) which they nicely told me when I was ordering it that it was a chopped steak burger. I appreciated that, as there was no surprise then when it arrived tableside. The sandwich was unique and highly savory, a good-sized rectangular steak burger on a hoagie roll with lettuce and tomato, chips, pickles, and a small slice of an orange. The chopped steak had some gyro meat spices in it which combined with the charcoal grilling to make a pleasurable flavor tsunami in my mouth. I teamed it up with a cup of lemon chicken and rice soup which was very savory as well. Juror #6 reported that he enjoyed his grilled ham and cheese sandwich ($6.50). Salads on ice at the Apollo Cafe. 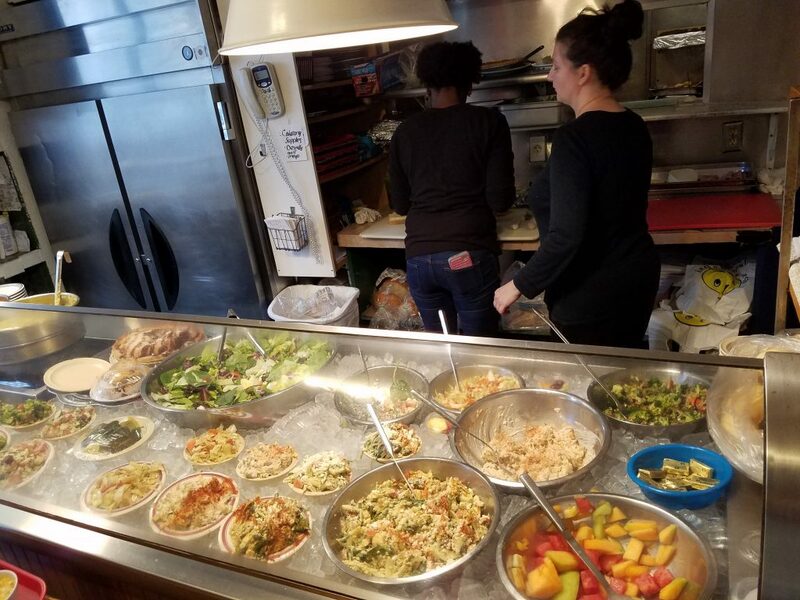 In addition to the usual lunchtime items the Apollo Cafe also serves shish kabob, gyros, quiche, stuffed grape leaves, and several different lunchtime salad platters with chicken, tuna, and egg salads. They also feature daily specials with a cup of soup and half a cold sandwich ($5.95) or cup of soup and a small garden salad ($6.95). A full line of breakfast offerings can also be had at the Apollo Cafe beginning at 7 a.m. The business is open Monday through Friday and closes at 3 p.m. They do not offer a juror discount, but Apollo Cafe is very reasonable and close to the City-County Building. Aside from waking up very early to shower and catch the bus into town each morning, jury duty was an interesting experience. I am now the most knowledgeable of my friends on rotator cuff injuries. And I met some very fine people on our jury. When in deliberations we treated each other with respect while discussing the different sides of the case. 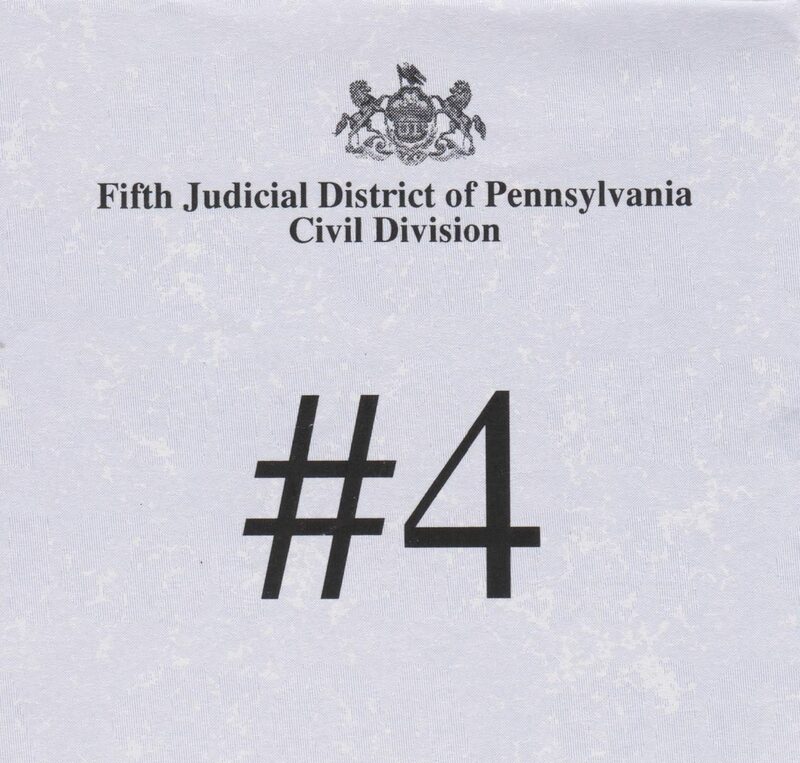 Common Pleas Court Judge John T. McVay, Jr. was kind and respectful to all in his courtroom: jurors, witnesses, and the attorneys for plaintiff and defendant. Sometimes in doing your (jury) duty you can have a little fun too. Story and photos by Rick Handler, Entertainment Central’s executive producer.